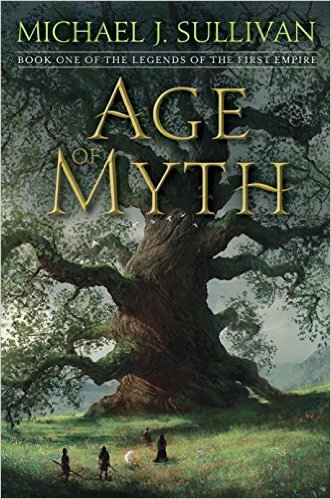 Age of Myth by Michael J. Sullivan Review | Nerd Much? The Legends of the First Empire is a six-book series set in the same world as the Riyria books, but several thousand years in the past. You may get more out of them if you’ve read the Riyria books first, as they provide a detailed account of the legends spoken of therein and paint a clearer picture of how that world came to be, but you can absolutely read and enjoy them even if you’re new to the series. One of my favorite aspects of Michael J. Sullivan’s writing is his ability to write complex female characters; he seems to understand that “strong female” doesn’t necessarily have to mean well-versed in combat, and that feminine doesn’t equal helpless. Also, as the standard age for fantasy heroes seems to be somewhere in the late teens (especially for females), it’s refreshing to see a middle-aged widow as one of the main characters. Suri’s character is enjoyable as well and reminds me a bit of Luna Lovegood from Harry Potter – charming in an eccentric way, with unconventional wisdom and zero regard for how the rest of the world sees her. Of course, this only applies to the main characters; Sullivan falls into the trap of making secondary characters a bit too one-dimensional and caricature-like. This is understandable to a degree, as they aren’t as prominent, but they have no nuance whatsoever and as a result are mildly irritating. Another notable characteristic of Sullivan’s work is the attention to detail and worldbuilding without the end result becoming too dense. The world he has created is immersive enough without the reader having to wade through pages and pages of heavy descriptions; the style is akin to writers like Brandon Sanderson and Scott Lynch, who are able to give a clear impression of the setting without weighing the text down. In Age of Myth, however, the plot often moves along at a crawl so this leaves it feeling fairly thin. The other major downside to this novel is that, unlike The Riyria Chronicles, it feels fairly generic (notable characters aside). Raithe is similar to every other reluctant male hero from every other epic fantasy novel, and the plot and setting have that vaguely familiar feel. Also (and I did find this to be the case with Riyria), there are points where it feels incredibly contrived, as the dialogue feels forced for the purpose of conveying information to the reader. There are some points where it is corny enough to be downright cringe-worthy. His characters also seem to be stubborn and ignorant to a fault; Persephone’s persistent and childlike naivete is often irritating. Overall, this is a solid fantasy read that will probably appeal to fans of The Riyria Chronicles, but there isn’t much to set it apart from the multitude of other epic fantasy reads out there. I liked it well enough, but it didn’t really leave a strong impression on me one way or the other.